Clark roams around Hamilton County, his land and that surrounding it are suffering a terrible drought despite the recent spells of rain. He takes to the skies and discovers that anything in remote proximity to the farm is dried out. As if on cue Dr. Alec Holland bursts from the ground warning Superman that he doesn't belong on this earth. The avatar of the green, Alec is also known as Swamp Thing! Swamp Thing tells Clark he was drawn to Hamilton because of the disturbances in nature and Clark recalls when his touch on the soil made it glow with blue energy. Swamp Thing goes on to explain that Superman draws upon more solar energy than his predecessor and it is that solar energy being drawn to his location that is killing the earth around him. Superman agrees to help but when he pats Alec's shoulder in reassurance the blue glow appears and begins killing Swamp Thing. In pain Alec lashes out attacking Clark until Superman formulates a plan and drags Alec deep into the soil hoping the earth will cleanse him of the infection. Cured, Alec realizes Superman has happened upon the remedy to the situation and offers to fuse with Clark. Misunderstanding Swamp Thing's actions Superman refuses to comply so Alec grows to gargantuan size and swallows Clark whole. Inside the avatar Clark awakens but his mind now one with Alec's own and Swamp Thing realizes that until Superman embraces the future as a citizen of this Earth rather than a visitor he and the Earth will repel each other. Superman embraces the green and is set free, with a new understanding of his new life and home. Story - 5: Dispelling the rumors that the blue glow in the soil was connected to The Watchmen, we instead find that after a year in action, Superman is no longer a strange visitor literally from another planet but one that has a wife, family and future on this Earth. It is an enjoyable tale that isn't mired down by the current storyline and instead goes into looking at Clark himself. I'm not unhappy about that, because it's when writers tumble from one story to the next that the character loses himself and the writers begin to see Clark as a blue and red suit. By taking time to explore the person IN the suit we gain a new perspective and a fantastic story. Art - 5: Having an artist continually push themselves is an unforgettable experience. We've all seen artists fall back on 'typical' poses but Jimenez is always throwing in something new, sometimes as they are retread they get reclassified as iconic. 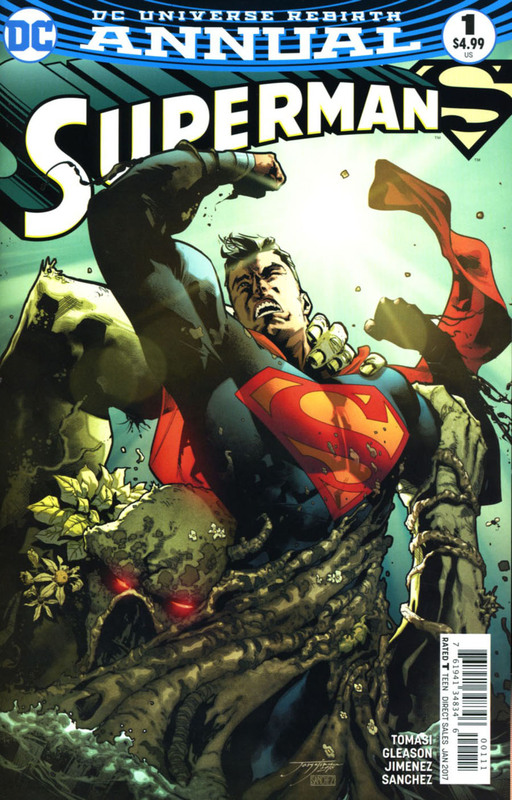 The fact that Swamp Thing takes up more of the book than Superman would be a downside for many but not for me. Alec's power set only worked at making Superman more dynamic and going up against him was something entirely different. Cover Art - 4: A spooky, Vertigo-esque style cover that lives up to its promise. I'm not particularly sold on the color palette but overall it's a great start to the new era of Annuals!